"So who is this camera for? I think it's for creative photographers who want a device that helps them produce uninhibited (and sometimes unpredictable) images that they can easily transfer to their mobile devices. Clearly, this isn't a camera for everyone. In the right hands, though, it can breathe new life into everyday imagery. And for that reason alone, it's worth keeping an eye on." But that doesn't mean the PowerShot N doesn't have its Cons as well as Pros. Here's how it stacks up for me. The most common remark that always surfaces when I write about this camera is that it's too expensive for its specification. I agree that $300 is a lot to spend for a compact camera. But it is a good camera with an excellent lens and WiFi. Maybe the price will come down later this year. When you first connect a Samsung Android device to your Mac for photo import, you might be disappointed to see that Aperture and iPhoto are not recognizing the device as a camera. I encountered this problem while working with a Samsung GC110 Galaxy digital camera that uses Android Jellybean for its operating system. You can easily fix the problem by switching its USB protocol from a Media Device (MTP) to a Camera (PTP). Here are the steps. Connect the Samsung Android device to a Mac via its USB cable. Power up the camera and go to its Home screen. Swipe downward on the screen from top to bottom to reveal the Notifications display. Under "Ongoing" it will probably read "Connected as a Media Device." Tap on that to reveal an options screen. In the following screen, check the box next to "Camera (PTP). Open Aperture or iPhoto, and the Samsung should appear as a camera in the import window. If you don't see the "Ongoing" screen in Step 3 when you swipe downward, don't despair. I didn't see it either at first. I downloaded the Samsung Kies software, installed it, then connected my camera with the Kies software running. Then the "Ongoing" option appeared in the Notifications screen on the camera. As a side note, the Kies software is handy for managing your Samsung device on either a Mac or Windows computer. 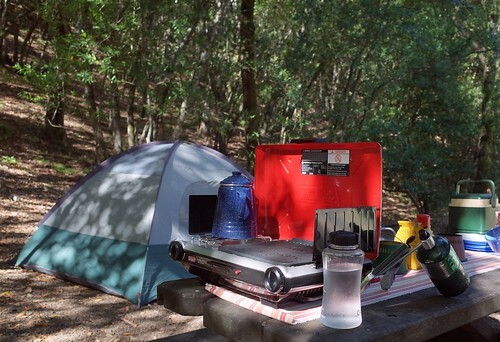 I'm camping in beautiful Sugar Loaf Ridge State Park for a couple days to test the new Ricoh GR APS-C compact camera. At first I didn't think I'd like a fixed focal length lens, but as it turns out, I'm having a blast with it. Here's home sweet home for the next couple days. I'll post more when I return on Sunday. Have a great weekend! 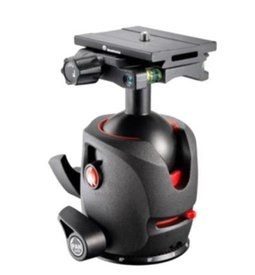 Manfrotto announced that its Top Lock Quick Release System is "compatible with Arca-style quick release plates and systems." This is big news in the world of tripods. And it seems like the only remaining question is (when it comes to tripod plates): do you put the hyphen in Arca-Swiss or not? This isn't to belittle any of the other excellent products on the market. But the fact that accessory giant Manfrotto chose Arca-Swiss for its new Top Lock product is noteworthy. I switched to Arca-Swiss a while back when I fell in love with Joby Ballhead X, and now have standardized on Arca-Swiss. Personally, I'm thrilled to see Manfrotto go this direction. Using one style quick release plate and having many different compatible options is exactly the scenario I like. When's the Last Time You Changed Your Cover Photo? If you're maintaining a Google+, Facebook, or Flickr page, you have a cover photo that spans from one side to the other. It's an opportunity to make a positive first impression when someone visits your site. When's the last time you refreshed this image? Or have you ever and are using the default picture that was provided for you? Flickr was the latest to switch to this look for users' home pages. And there are still a lot of default covers out there. You might want to take a moment and refresh yours. Actually, I think it's a good idea to spruce up the page every month or so. Here's a short video on how to update your cover photo for flickr. View this entire Flickr Essential Training (2013) course. While you're at it, you might want to take a look at your other pages too. 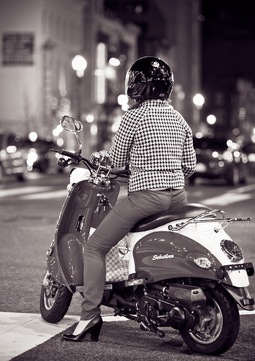 Maybe you've shot something recently that would make a great cover image. It only takes a few seconds to refresh your home page. And it feels so good! This week on The Digital Story: 5 surefire flash tips, Photo Help Desk question of the week, more on new Aperture courses - All of this and more in today's photography podcast. People shots in bright, contrasty light fare better with fill flash. In Program mode, flash exposure compensation controls the light on the subject, and exposure compensation affects the background. Carry a white business card and rubber band to create an emergency kick light for bounce flash. Indoors, try manual mode with these settings: ISO 400, 1/15th, f/5.6. Adjust as needed. Hold the flash up with your left hand, the camera in your right, and use TTL wireless for communication. 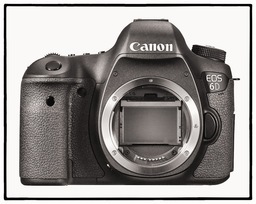 Story #2 - Photo Help Desk Question of the Week: "Why move from a cropped sensor to a full frame DSLR?" I add more detail to the answer. Story #3 - New Aperture Training coming your way. I've just completed "Portrait Retouching with Aperture" and "Enhancing Product Photography with Aperture," and they are fun! I explain why in the third story. In addition to subscribing in iTunes, you can also download the podcast here (28 minutes). You can support this podcast by purchasing the TDS iPhone App for only $2.99 from the Apple App Store. Make Your Photos Sizzle with Color! -- SizzlPix is like High Definition TV for your photography.Special Summer Sale! Just add "TDS: in the comments space of your SizzlPix! order, and you will get 20 percent off the entire order. Limited time offer. Take advantage now. Looks fantastic, especially for iPad photographers who need additional storage. I plan on testing one myself. And the first thing I'll be examining is speed. My experience with wireless transfer in general with an iPad is pedestrian read/write rates (that is, assuming as @MyDarkroom pointed out on Twitter, that you can even write to these devices from a tablet). Those slower speeds are tolerable in a Jpeg workflow with a handful of pictures. But if you have 600 shots from a full day of shooting, and if those are Raw files, then you're probably going to reach for the laptop instead of the tablet. We'll see after some real world use. It's promising news indeed, but don't get too excited quite yet. Should You Consider Your Digital Zoom in a Pinch? Five years ago when writing Digital Photography Companion, I recommended staying away from the digital zoom setting on a compact camera. 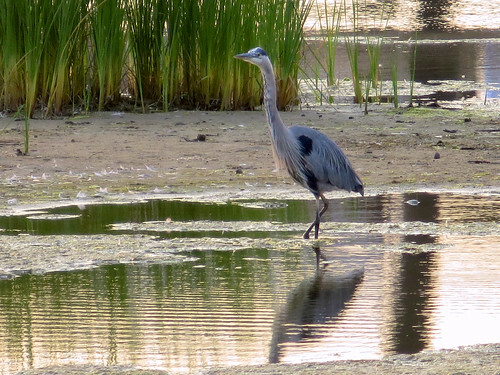 My feeling was that it's better to rely on the optics of your lens, then crop as needed. So if you have a 28-105mm optical zoom, use 105mm, and stay away from adding on focal length by turning on the digital zoom function for that camera. 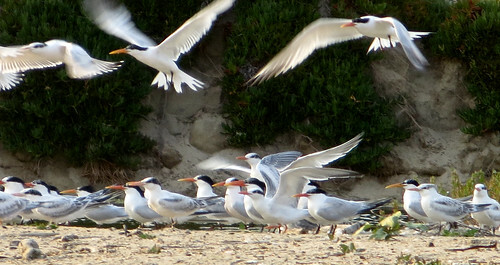 Sea birds in Santa Barbara with a Canon PowerShot N and digital zoom. But with today's cameras, should you really avoid the digital zoom? Every now and then I like to revisit my opinions to see if they still apply in the face of changing technology. 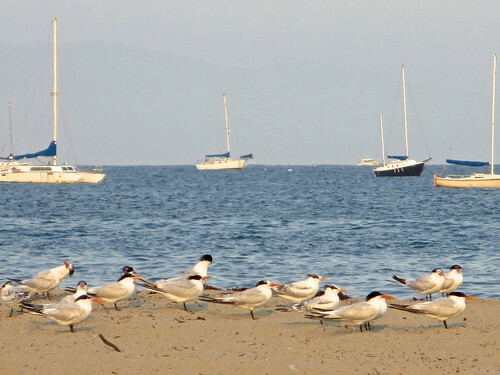 To test my digital zoom opinion, I photographed sea birds in Santa Barbara with a Canon PowerShot N that has an 8X optical lens plus a 32X digital zoom. I normally stay away from anything over 8X. But this evening, I shot with wild abandon using 12X, 24X, and sometimes even more. I worked with these 12 MP Jpegs just as I would normally edit any other picture in Aperture. I cropped as needed, adjusted color, tweaked exposure, etc. I didn't add any sharpening, however, because I didn't want the image to fall apart. Birds and Boats with a Canon PowerShot N using the digital zoom. So after reviewing these images on my MacBook Pro Retina display, have I changed my opinion about the digital zoom function? Not entirely. But I'm certainly softening my stance about using digital zoom. For highest quality, I still shy away from letting the camera play with my image. But in certain situations, I'll consider it, especially if the images are being captured for web publishing. I used Flickr to publish these images. If you want to learn more about Flickr, check out my Flickr Essential Training on lynda.com. Both TIPA (Technical Image Press Association) and EISA (European Imaging and Sound Association) have announced their Best Cameras and Lenses of 2013. There are not many surprises in the respective lists. But what's interesting are the differences. For example, in the DSLR categories, Canon fared better with TIPA (EOS Rebel SL1 and 6D), while in Europe, Nikon had the stronger showing with the D800 and the D4. 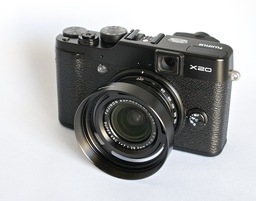 In the expert compact category, TIPA like the Fujifilm X20 while EISA preferred the Sony RX100. And for best mirrorless body? TIPA selected the Panasonic GH3 while EISA choose the Samsung NX20 (EISA awarded the OM-D top honors in a different category). Bottom line is, it's pretty much what I've been saying all along: there are so many great cameras out there. It's a matter of which one is the best fit for you. You can see the entire list at dphotojournal.com.